Sunshine-filled days, golden beaches and clear, blue sea await you at Club Las Adelfas. This highly rated resort is perfectly situated on Lanzarote, the “most tranquil Canary Island” and the best way to experience this fabulous destination is with Lanzarote timeshares for sale at Club Las Adelfas! Vacationers return often to Club Las Adelfas because of its great location, accommodating staff & service, cleanliness, and many excellent amenities. Perfectly landscaped gardens provide outside serenity. The sunny yellow walls in the studio, one and two bedroom timeshare apartments add a bright vibrancy to the inside. 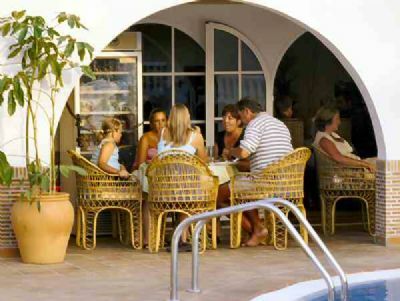 A furnished balcony or terrace overlooks the magnificent swimming pool. Holiday apartments feature a full kitchen, (guests receive a complimentary welcome package of tea, coffee, sugar and water) full bath with toiletries, and a comfortable living area with pull-out sofa and Cable/Satellite TV and CD Player/Stereo. Your timeshare will stay cool with air conditioning and ceiling fans. Maid service, car hire, and excursions can be booked at reception. Free roadside parking is plentiful. Club Adelfas sits on the coastline of five miles of beautiful beaches that have been awarded the Blue Flag by the EU for cleanliness. They offer excellent facilities, loungers and sun shades. The tranquil waters are excellent for swimming and other water sports. While in the resort’s gorgeous pool, swim up to the pool bar for a refreshing drink. Let the kids have fun in the children’s pool. Savor the resort’s delicious food at the Clubhouse Restaurant and bar that features nightly entertainment, or stroll to other restaurants, bars and shops found along the beachfront Avenidas. Contact Club Las Adelfas - Compass Club Specialist Today!